Western blot analysis of HeLa cells, untreated (-) or treated with the 26S proteasome inhibitor MG-132 #2194 (50 µM, 90 min; +), using Ubiquitin (P4D1) Mouse mAb (HRP Conjugate). Ubiquitin (P4D1) Mouse mAb (HRP Conjugate) detects ubiquitin, polyubiquitin, and ubiquitinated proteins. This antibody may cross-react with recombinant NEDD8. Monoclonal antibody is produced by immunizing animals with 1-76 full-length bovine ubiquitin. 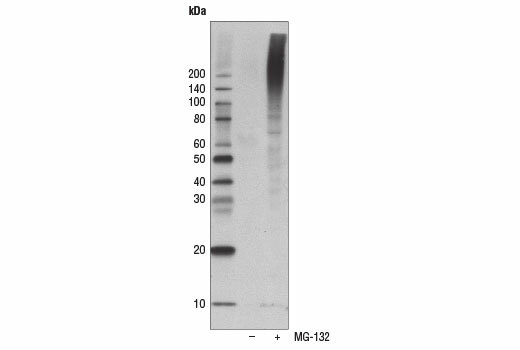 This Cell Signaling Technology antibody is conjugated to the carbohydrate groups of horseradish peroxidase (HRP) via its amine groups. The HRP conjugated antibody is expected to exhibit the same species cross-reactivity as the unconjugated Ubiquitin (P4D1) Mouse mAb #3936.